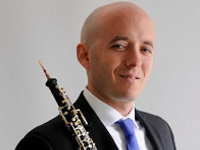 Dr. Aaron Hill serves as Assistant Professor of Oboe at the University of Nevada-Reno and principal oboe of the Wintergreen Festival Orchestra. Prior to moving to Reno, he held appointments teaching oboe at the University of Wisconsin-Madison, University of Virginia, and James Madison University. While in Virginia, he held the positions of principal oboe of the Charlottesville Symphony and English horn with the Roanoke Symphony. His academic affiliations have included extensive chamber music activities with the Wingra Wind Quintet and Albemarle Ensemble. This performance will be Dr. Hill's first faculty recital at University of Nevada, Reno.